Techniques to be used in this work include working a sum backwards and using rules of multiplication to find missing numbers. Eg 4? × 7 = 301. If a missing digit must be multiplied by 7 and the answer ends in 1, the missing digit must be 3 (7 × 3 = 21). Some questions are written horizontally eg 4?7 – 236 = ?51. In finding the missing digits children may prefer to rewrite the sum in vertical form. The questions in this module are similar to the ones set on the calculator papers in previous years. Some do not need a calculator if the children are proficient at mental arithmetic, but children can use a calculator if they wish. In any case, they should be encouraged to check their answers on the calculator. Many of the problems in this module are “wordy”. This is quite deliberate as the National Tests contain many such problems. It is important that children are able to extract the information required to perform the calculations and, indeed, to know what operation (+, –, × or ÷) is required. Children generally find this difficult, so practice is required. Teaching children to “add a nought” when multiplying by ten generally leads to a complete misunderstanding of the process and wrong answers when dealing with decimals (4.7 × 10 = 4.70 is unfortunately incorrect). After analysing all the past NCT papers, we have found that questions in this section fall mainly into the following types which are practised on the pages in this module. Explaining why certain answers are possible or impossible for certain problems. We expect to see an increase in the number of this type of problem on the papers in the future. As hinted at above, the questions are normally progressive in difficulty level and children need to learn to read the questions carefully as they can often be wordy. Obviously the main topic covered in this module is that of “money” and children should be familiar with converting from pounds and pence to pence and vice versa (eg £3.45 = 345p). They will also need to be capable of extracting the information needed at a given point in the question from all that displayed on the page. This is an idea that many children find difficult and patience in this area will be needed. Great concentration is needed when tackling these questions because of the amount of reading involved and the more difficult values of the numbers. Children should be very familiar with their calculators and know such things as 34.6 means £34.60 if the answer is an amount of money. They should know that 0.5 is £0.50 (50p) and that 0.05 is £0.05 (5p). Calculators may be used on more difficult questions. You should push the children to do as much in their heads or on paper as they can as this gives very good practice. Obviously, there comes a point when use of a calculator becomes desirable. Some answers are more open ended and have many possibilities. We have tried to show patterns of possible answers where this is feasible. A good knowledge of odd, even, square, triangle and prime numbers is required for this work and children should be regularly tested to see if they know these. Calculation of factors and multiples is also required. They should also be familiar with the tests for divisibility and how to combine them. This is quite a straight forward module looking at sequences in different ways. (Eg × 2 and + 5). A large part of this module is devoted to work on equivalent fractions. This is partly because a good understanding of equivalent fractions is absolutely necessary for competent work in fractions and also because there are quite a number of equivalent fraction questions on the test papers. Children should also be able to convert fractions to decimals by dividing the numerator by the denominator with a calculator (fractions, after all, are division sums). Children should be able to find simple fractions of quantities and shapes and should know the percentage equivalents of fractions. Reading digital and analogue clocks and performing simple calculations with these. Reading simple timetables and performing calculations related to these, such as calculating the time between two events or how long will it be before a certain event happens. Reading calendars and performing simple calculations such as working out how many days there are between two dates. Children therefore need to be able to read clocks, timetables and calendars with ease. This module gives good practice in these skills. Probability is often thought to be an easy aspect of Maths at this level, but many children, and indeed adults have difficulty with this. An example of this is when a fair coin is tossed 4 or 5 times and lands on heads each time. The key word here is “fair” ( ie not weighted unevenly), as this means that there is an equal chance of landing on heads or tails on the next throw, irrespective of what has happened in the earlier throws. This type of question is popular in the test papers. When explaining the reasons for their answers encourage using mathematical terms with probabilities written as fractions, ratios or percentages and these compared eg 2:4 ratio is the same as 3:6. vague answers will not gain marks in the tests. Questions in this module are concerned with reading scales on measuring devices such as thermometers, measuring cylinders and weighing scales. Whatever the instrument, the basic principle is the same: it is most important that children look at the scale to see how many units one division represents. 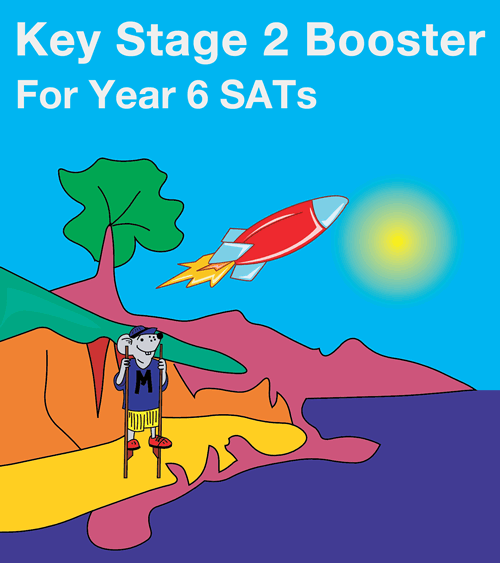 There are plenty of graphs, tables and charts in the Key Stage 2 tests – probably more than any other topic. Adults often take reading of tables for granted and some children come across them frequently in their daily lives – eg football tables, fixtures etc. However, other children seldom come across them and find them difficult to interpret without plenty of explanation of how they work. Questions on nets of 3 D shapes do come up quite frequently and can prove to be very difficult. The most popular involve nets of cubes and children should be familiar with all 12 possible nets that will make a cube. Plenty of cutting out and folding is needed for children to succeed with this. Nets of pyramids also come up and these tend to be easier to visualise. Drawing on missing faces of cubes and triangular boxes can also prove very difficult. Some children (and adults) find visualising these almost impossible without cutting the shapes out and making them up. This module gives practice in sorting shapes according to their properties. Children should be familiar with the different types of triangles (scalene, isosceles, equilateral, right angled and right angled isosceles) and the different types of quadrilaterals (squares, rectangles, kites, parallelograms, rhombuses, trapezia). They should know the properties of all these shapes ( parallel lines, equal angles etc) and be able to spot them in any orientation and to state their properties). They should recognise pentagons, hexagons and octagons, both regular and irregular. They should be able to find the perimeter and area of simple shapes and be able to spot shapes with similar perimeters or areas. The should know the different types of angle (acute, right , obtuse and reflex) and be beginning to measure angles with a protractor or similar instrument. They should know the angles of a triangle add to 180° and that angles on a straight line add to 180°. Most of the work in this module is at level 3/4, although there are some more difficult questions at level 5 at the end. Children often mix up reflective and rotational symmetry and it is important when teaching these concepts to constantly point out the differences. In reflective symmetry, children should be able to spot when shapes have reflective symmetry and be able to draw in the lines of symmetry. Some shapes are a little confusing. For example, a square has four lines of symmetry, but a rectangle only has two and it is worth reinforcing this idea many times as this is often a test question. They should be able to pick out which of a number of shapes is a correct reflection of a given shape. Normally, children are allowed to use tracing paper if they wish, but they should move away from this technique when they are more capable and begin to analyse the position of the points forming the corners of the shape. They should be able to complete a shape in a mirror line and again may use tracing paper if they wish. In rotational symmetry, children should realise that a shape has rotational symmetry if it can be turned to a new position and still look the same. For example, a square can be turned through a right angle four times and each time it looks the same. We say a square has rotational symmetry of order 4. It is also important for children to be able to find the centre of rotation of a shape (tracing paper may be used if necessary) and to complete a given shape to give it rotational symmetry. There have been very few straightforward measurement of length questions in the tests. The easiest has been a question asking for the longest side of a triangle to be measured…. and even that asked for the answer in millimetres. It seems that simple measurement of length is taken for granted! However, there have been a number of questions which ask for comparisons of area. Usually the shapes to be compared are on a square grid and it is only a matter of carefully counting the squares to reach the right answer. Encourage the idea that area is the amount of space inside a two dimensional shape and that it is measured in square units such as square centimetres (cm2) or square metres (m2). Other popular questions ask for children to draw shapes with an equal area to one shown. When doing these types of question encourage keeping to the guidelines drawn and keeping the shapes simple. Children often become confused when dealing with perimeter and area. This usually arises when children are told that the area of a rectangle can be worked out from the length and width. It can not be pointed out often enough that the area of a shape does not necessarily relate to the perimeter – a long thin rectangle can have a very small area compared to a square with the same length perimeter.